Having trouble starting ArcMap 10? There is probably nothing more frustrating than to see the below screenshot. Thankfully, most of us will not experience it very often (if at all), but if you do experience this screen more frequently than you would like on start-up, then read on as help is at hand! The reasons for this crashing or hanging might be varied but listed below are some of the more common causes that you may try to resolve the issue. All of the user preferences for the toolbar configurations in ArcMap are stored in a special file called the normal.mxt. This is useful as it allows the user to setup ArcMap to have only the toolbars that they require available, and where they want them for ease of use and familiarity. ArcMap loads these settings during the start-up process. On occasions however, the normal.mxt can become corrupted. If this happens the normal.mxt cannot be opened, and hence ArcMap fails to start and crashes. Once renamed, try restarting ArcMap. A new normal.mxt should be created in the above location. If this does not resolve the issue, delete the new normal.mxt, and then rename the OLD_normal.mxt back to normal.mxt to restore your user preferences again. If this does not work, we can try resetting the entire Esri profile. The ESRI folder stores additional user defined information. For example, custom toolboxes, models, address locators and database or server connection files. Again, it can be that ArcMap is trying to access a corrupt file within this directory thus hanging when initializing. As with the normal.mxt, this is done by renaming the ESRI folder to Old_ESRI. Once renamed, try restarting ArcMap. A new ESRI folder should be created in the above location. If this does not resolve the issue, delete the new ESRI folder, and then rename the Old_ESRI folder back to ESRI to restore your user preferences again. Out-of-date Graphics Card drivers are another of the common causes for the software to crash or hang when initializing. The ArcGIS Desktop 10 System Requirements state that the machine must have a minimum of 64MB RAM, have a 24 bit capable graphics accelerator, and have OpenGL v2.0 or higher. You are able to check the OpenGL version by installing an OpenGL viewer, such as the OpenGL Extensions Viewer Utility. Select the File as “OpenGL Extension Viewer” and the platform as "Windows XP/Vista/7" and Click Download. The following Esri Inc blog describes this utility in further detail. Further information regarding graphics cards can be found here. 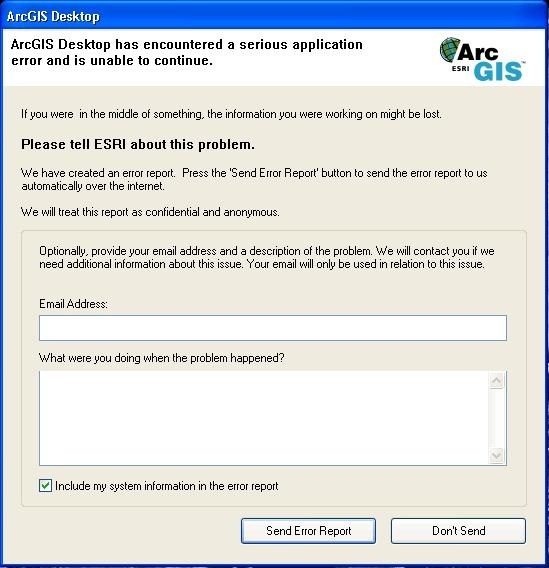 If, after trying the above suggestions, ArcMap still does not open, please get in touch with the Technical Support Team (support@esriuk.com). We will be happy to look into your issue and help you resolve the problem as quickly as possible to get you back up and running. 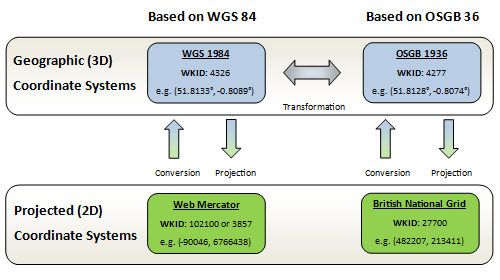 When transforming data between WGS-84 and BNG it can be confusing which options to choose. At ArcGIS 10 you are presented with 7 different options. So, what are the differences and which one should you choose? Essentially each option has a different accuracy depending on the output accuracy you require on your data but also the geographic area in which it resides. This is best summarised using the following table (reproduced by kind permission from Jim Sibbald). As you can see the OSGB_1936_To_WGS_1984_Petroleum has the best accuracy around the UK out of the box within ArcGIS. However, what if you are collecting data from a GPS device in WGS-84 and when transforming you require greater accuracy than ±2 meters? The most accurate transformation between British National Grid and WGS 1984 would be using the OSTN02 transformation. At present, out of the box, ArcGIS doesn’t support this type of transformation. If you require this level of accuracy there are a number of options depending on the version of ArcGIS that you’re using. However, after working in collaboration with DGC and Ordnance Survey, Esri UK have released OSTN02 support within ArcGIS desktop. Users of ArcGIS 10.1 will be able to take advantage of OSGB_1936_To_WGS_1984_7 supported as shown in Figure 1. This requires the user to download the .grb file from Ordnance Survey and to place it in the appropriate folder. To utilise this transformation method simply download and paste the OSTN02_NTv2.gsb into a folder called ‘C:\Program Files\ArcGIS\Desktop10.1\pedata\ntv2\uk’. You will need to create the folder called ‘uk’ which must be in lower case. Next time you restart ArcGIS 10.1 you will be able to use this transformation from the Geographic Coordinate Systems Transformations dialog box. Details of the copyright and liability of the files are here. To add this support in ArcGIS 10 you will need to download and install an add-in. More information about this add-in can be found in the following blog article: OSTN02 supported in ArcGIS desktop. In both cases, if you are using ArcGIS Server then remember that you need to install it in both areas, especially if you are publishing maps from an MXD with it applied. As such, the OSTN02 transformation is the most accurate but not included by default. With most UK data requiring an accuracy of approximately ± 2 meters the Petroleum transformation is fine for common applications and uses. This blog post gives a basic introduction to coordinate systems and projections, with a focus on UK data. To seasoned geographers, I apologise for all the things I've simplified or simply left out! My intention is to provide GIS novices who are a bit confused by the topic with just enough about various different coordinate systems to get started working with them in ArcGIS. Anyone looking for an excellent comprehensive introduction should refer to Ordnance Survey's guide. 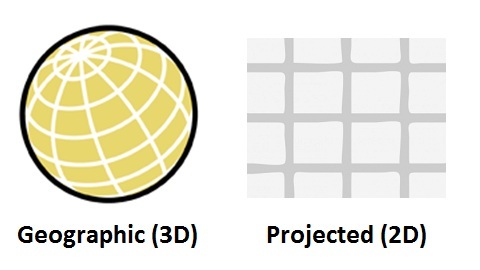 A geographic coordinate system (GCS) uses a grid on the surface of a 3D globe (the technical term for this grid is graticule; the North/South lines are lines of longitude and the East/West lines are lines of latitude). Graticule lines are not parallel to each other because they are defined using angles (e.g. degrees) from the centre of the globe, not linear units (e.g. metres) on a flat surface. A projected coordinate system (PCS) is a flattened version of a 3D coordinate system. Grid lines are parallel, and coordinates are given in "flat" units like metres or feet. Although the Earth isn't flat, we often use flat surfaces to represent it (paper surfaces, computer screens, etc), so we frequently need to convert 3D coordinates to 2D coordinates. However, there's a problem: imagine peeling the skin off an orange and trying to make it sit flat on a table. It's not possible to do this without ripping or stretching the peel! It's the same with a 3D coordinate system. Whenever we flatten, or "project", a 3D coordinate grid to a 2D coordinate grid, we have to distort the grid's proportions somehow. Distances, shapes, areas, and angles, or some combination of all four, are deformed. If you work with UK data, there are two geographic and two projected coordinate systems that you should know about. They are shown in the diagram below, along with the numeric WKID (Well-Known ID) of that GCS/PCS, as well as their relationships with one another and example coordinates in each system showing the location of Esri UK's head office in Aylesbury. World Geodetic System (WGS-84) is familiar to many non-geographers because it is used by GPS devices to describe locations all over the Earth. A different GCS, called OSGB-36, which is more accurate for describing locations in Britain but not as good for other countries, is used specifically for British data. Web Mercator is a PCS based on WGS-84 used for global maps, and British National Grid is a PCS based on OSGB-36 used for British maps. For each GCS, there are many different ways of converting, or "projecting", 3D coordinates to 2D coordinates. Web Mercator and British National Grid are the most important projections for their respective geographic coordinate systems. There are alternative projections, each with its own pros and cons (this link has more information, as well as an entertaining video clip). Converting between coordinate systems that are based on the same GCS is relatively straightforward, but when converting, for example, GPS (WGS-84) coordinates to BNG eastings and northings, a mathematical transformation is required. The "Petroleum" transformation is an accurate transformation from WGS-84 to OSGB-36 (and vice-versa) included with ArcGIS. To convert data between WGS-84 and BNG in ArcGIS Desktop, you should use the Project tool. Make sure you select the "Petroleum" transformation otherwise your results will not be accurate. For GB data, you only really need to know about WGS-84 and BNG, and that you should use the Petroleum transformation to get an accurate conversion between them. You will also need to use "Petroleum" to convert between BNG/OSGB-36 and Web Mercator (or WGS 1984 Web Mercator Auxiliary Sphere, to give it the name used by Esri). Web Mercator has become the standard projection for international consumer web maps, such as Google Maps, Bing Maps, and OpenStreetMap. All ArcGIS Online basemaps are also in this projection. You can read more about choosing a projection for UK data here. There is also a post that talks about working with British National Grid data and Web Mercator basemaps here. My name is Andy, one of the Desktop Support Analysts here in the Technical Support team. We are here to help with any questions or queries you may have regarding the Desktop Suite of products developed by Esri Inc or Esri UK. Here in the Esri UK Technical Support team every day is different. We are asked about just about anything you can think of, some of which we have heard of, and some that we haven’t! Looking through some of our old support calls, there are however, some subjects that are asked about more frequently than others. At v9.x, the ability to run a Server Status Enquiry was a routine task for many ArcGIS Licence Administrators within an organisation, allowing for the efficient management of their licences. It was run directly from the 9.x Licence Manager and allowed the user to see what licences were available, how many were available, and which users were consuming licences at that particular time. Press enter. This will change the current working directory to the specified path. Press enter. This will display the information previously given by the Status Enquiry. Pretty simple stuff really, but not quite as obvious. You may then run the Batch file simply by double clicking the file! So as you can see, all the functionality is still there, you just have to search and find it! Why not look a little harder and see what else may still be possible using Command Prompt?